We’re only four weeks into Spring Semester, and the Vassar Haiti Project has already accomplished an unprecedented number of wonderful fundraisers and events: from the fabulously successful Sacred Heart Sale, to our brand-new VAST teaching initiatives, March Trip fundraising sales and Creole lessons, the upcoming ‘Dinner Party’ and the ever looming April Parents’ Weekend Sale – it’s a whirlwind! To top it off, we had over ten new members show up at our last General Body meeting, another great example of our unprecedented campus presence. In light of this fantastic momentum, we wanted to take a moment this week to reflect on where we stand as a collective. Fiona: I know that for my part, in my three and a half years working with the Project, I have never witnessed such a high volume of activity and excitement among our members! 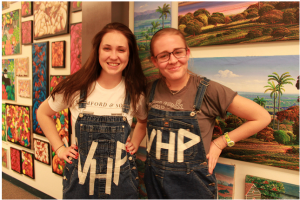 VHP has always represented something important, something bigger, beyond the Liberal Arts’ tendency to focus on the individual experience. We have never been lacking in passion and enthusiasm – but I know from experience that it has taken several years and many improvements and lessons learned for us to reach this current stage of organized, professional enthusiasm. Today, we have some amazing student teams working for Programming, Outreach, Publicity and Merchandise, as well as the Water, Reforestation, Education, Medical and Grants Initiatives – and while Lila and Andrew are still the loving guardians of the Project and its members, we have more students taking over leadership than ever before. I am incredibly proud of our Oversight team for the many hours they put into leading their students, and I am inspired by the continued commitment from every familiar face that I see attending our GB and Committee meetings. With this blog post, I would like to acknowledge each and every leader and member for making this such a fantastic year to learn from each of you. While the sheer number of goals we set ourselves can sometimes be daunting, it is because we have set the bar incredibly high for this beautiful Project. Thank you for everything you do. Nothing that is worth doing can be achieved in our lifetime; therefore we must be saved by hope. Nothing which is true or beautiful or good makes complete sense in any immediate context of history; therefore we must be saved by fate. Nothing we do, however virtuous, can be accomplished alone; therefore we must be saved by love. Caitlyn: Throughout the past three and a half years I have spent at Vassar as an enthusiastic member of the Vassar Haiti Project, I have stood witness to the absolutely amazing evolution and on going development of this organization as a whole. For some of our newest members who may not be aware, VHP has been re-structured several times in the past few years and I believe that we have finally found our groove. Our efficiency and energy astound me. I have been taken aback this year not only by the number of new members who have joined but also by the energy and immediate commitment these fresh faces have been bringing to the table. I want to thank our Oversight members for helping to create an environment in which these new members can find their footing within the project with ease and excitement. I also want to thank Oversight for the blood, sweat, and tears they have all poured into this project all year. One would never believe we were also full time students! !